A few days ago AFFINImeter launched an Isothermal Titration Calorimetry (ITC) data analysis challenge. Here the participant had to globally analyse a set of Isothermal Titration Calorimetry experiments using AFFINImeter and get the thermodynamic and structural parameters of the interaction between both molecules (the receptor protein and the ligand). During the last days we though it might be useful to help you throughout the fittings proposed for the contest. Therefore, we have prepared a video that explains, step by step, How to fit CURVE 1. IMPORTANTLY, this information will be of great help to solve step 2, the global fitting of CURVES 1-4. The data proposed for the contest will remain available here, in case you want to learn more about it or to try it by yourself. 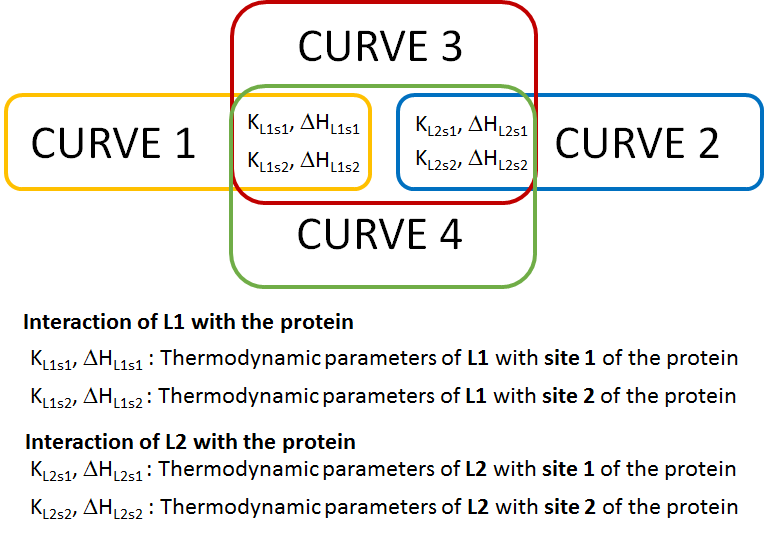 CURVE 1 and CURVE 2 describe the interaction of L1 and L2 with the protein, respectively. They describe different interaction events and therefore they don´t have any thermodynamic parameter in common. CURVE 3 corresponds to a competitive experiment of a mixture of L1 and L2 binding to the protein. This means that, it has the thermodynamic information of both interaction events: CURVE 3 will share thermodynamic parameters with CURVE 1 and CURVE 2…(and also CURVE 4). CURVE 4 is also a competitive experiment, similar to CURVE 3 and again, has the thermodynamic information of both interactions. 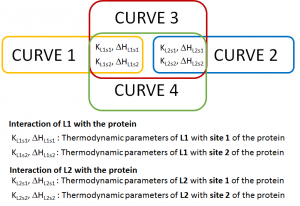 Then, CURVE 4 shares thermodynamic parameters with CURVE 1, CURVE 2 and CURVE 3. NOW,…how do we define all this information into our AFFINImeter global fitting? We have to “link” parameters among curves to “tell” AFFINImeter that we are considering those parameters as equal. 1. Click on the button “link parameters” and then click on the Value/eq box corresponding to the parameter K of CURVE 1 that describes the association constant of L1 to s1. 2. Click on the Value/eq box corresponding to the parameter of CURVE 3 that defines the association constant of L1 to s1. 3. Click on the Value/eq box corresponding to the parameter of CURVE 4 that defines the association constant of L1 to s1. 4. Click on the button “Done” to finish and leave the link parameter mode (NOTE: when you are in the link parameter mode all the functions in the screen are locked except the link function. In order to recover all the functionalities you have to click on “Done”). 5. IMPORTANTLY! The box “FIT” has to be checked for the parameter K of CURVE 1 but it has to be unchecked for the parameter K of CURVES 3 and 4, since now they are related to K of CURVE 1. Stoichiometric and site constants: two approaches to analyze data with AFFINImeter.